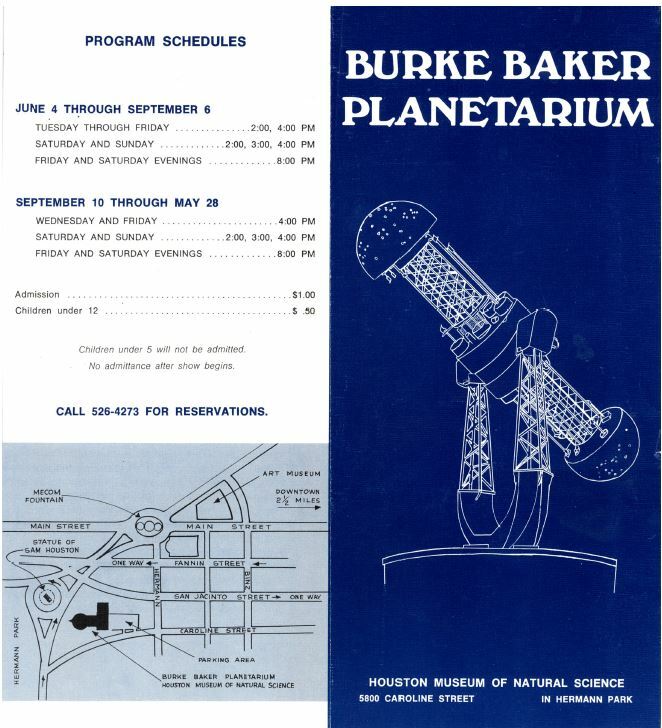 In July of 1964, the Houston Museum of Natural Science opened its new museum in Hermann Park with modest exhibit space and the Burke Baker Planetarium. 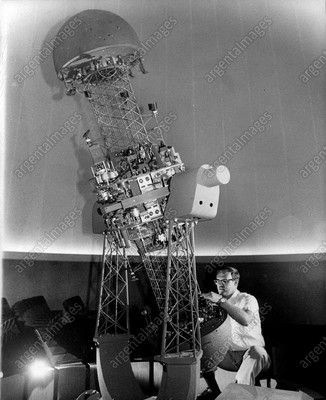 A state-of-the-art Spitz Space Transit Planetarium dominated the theater’s center with its flat floor and a few slide projectors. Two star balls connected by cages, swinging in a yoke, generated the moving stars and planets. All programs were live star tours. That year the Houston Independent School District began sending students to the Burke Baker Planetarium. In the last 50 years, over a million HISD children have explored the starry night in an experience reaching every HISD student at least once. 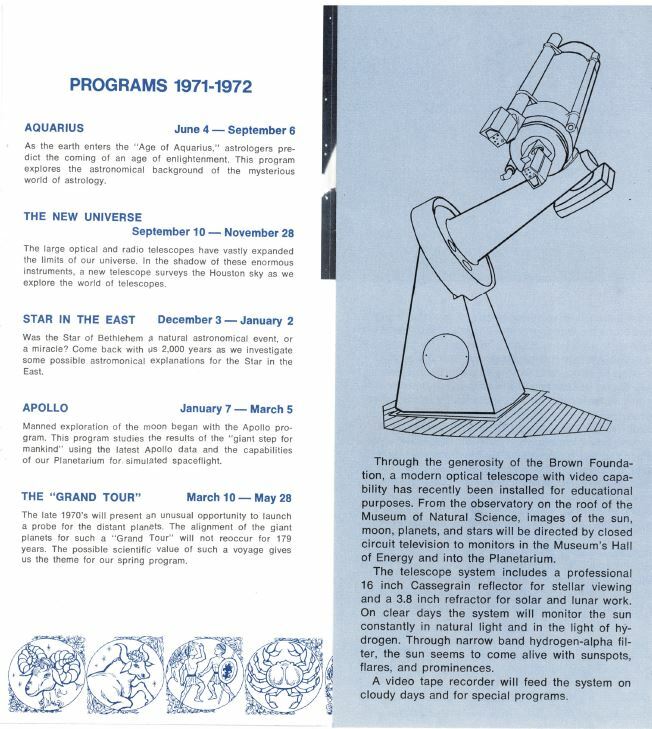 For an idea of what the planetarium experience was back in the 1970s, take a look at my first Burke Baker Planetarium brochure. The brochure was a 3-fold with the front and back cover shown below. The address was 5800 Caroline Street. When you called for reservations, you only used seven digits. The museum was free, but the planetarium cost $1 for adults and 50 cents for children. We did two or three shows a day plus morning school shows and thought we were busy. Now we do 13 to 16 shows each day. Notice the map. The passage between the planetarium and the tiny museum was a glassed-in breezeway. 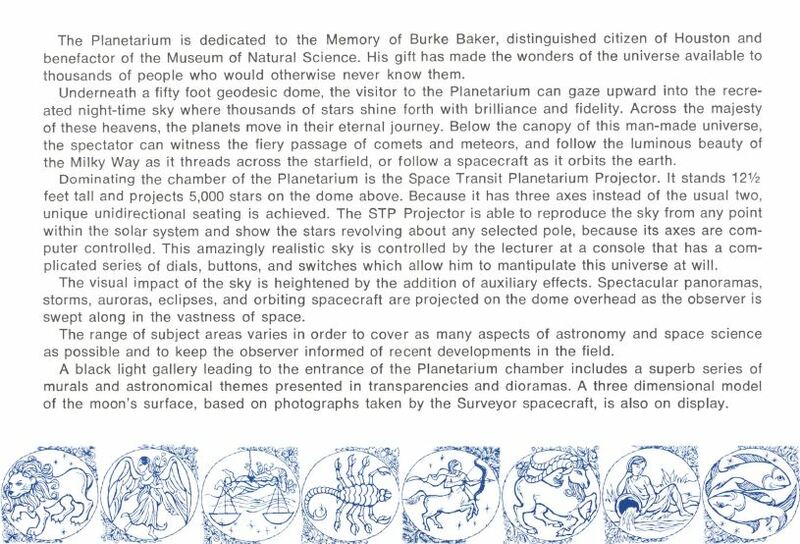 Inside the brochure was a description of the planetarium experience. Burke Baker’s gift has now brought the astronomy experience to more than 7.5 million people, including all upper elementary students in the Houston Independent School District since 1965. Below is the fold over section showing our new Margaret Root Brown Telescope, which is still behind my office on the third floor. We need an access across the roof to open it up to the public once again as well as realuminizing of the mirror. The telescope tracked the sun automatically and sent a live image to the planetarium and the Energy Hall in the lower level. We created five new shows each year, but they were much easier to produce than the two new shows we do now. In 1988, the Burke Baker Planetarium was one of the first in the world to go digital. In a capital campaign that funded the Wortham Giant Screen Theatre, the planetarium’s Friedkin Theater became a space simulator with an Evans & Sutherland Digistar 1, the world’s first digital planetarium projection system. 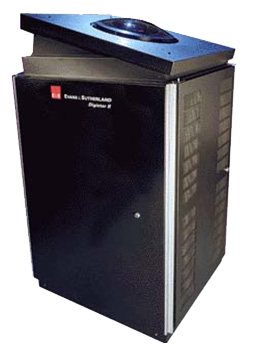 In 1998, a decade later, the Burke Baker Planetarium was first in the United States and second in the world to install a Digital Sky full-dome digital video projection system. This dynamic immersive environment was funded by a grant from NASA through Rice University. Now the planetarium could offer full-dome animations and movies with a new slightly tilted dome and seats. The planetarium’s Cosmic Mysteries and Powers of Time were among the first full dome digital films produced. Eighteen years later, the Friedkin Theater of the Burke Baker Planetarium becomes the most advanced True 8K planetarium in the world. On March 11, HMNS will unveil an overhauled theater featuring an all-new, tilted, seamless projection dome and the main attraction, the Evans & Sutherland Digistar 5 digital projection system. This cutting-edge system brings the highest resolution, the brightest colors, and the most advanced spatial imaging technology on the market to the planetarium, restoring its status as best in the world. Editor’s note: Keep your eyes peeled for more details about the Planetarium renovation on social media, Facebook, Instagram, Twitter, and right here on our BEYONDbones blog. Throughout the month of February and early March, we’ll be posting the latest information about the project until the grand opening March 11. Previous Post Seeing Stars with James Wooten: Five planets at dawn, leap day this February! Next Post This Dino Toy's All Wrong! What's Up With That! ?